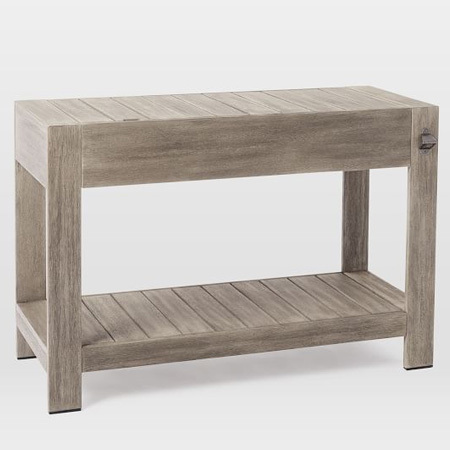 This outdoor bar measures 770mm H x 460mm D x 1180mm L and is perfect for your outdoor entertainment area or for on a patio. 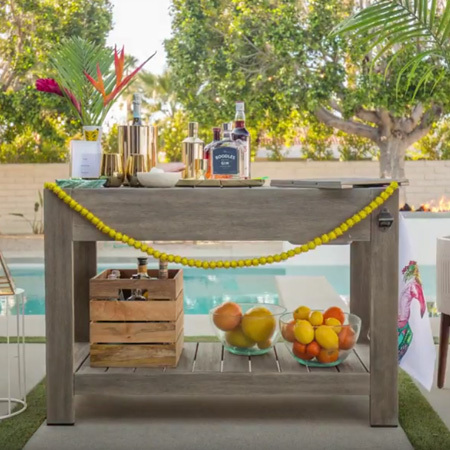 You can make the outdoor bar using PAR pine, your choice of hardwood, or you can even use reclaimed timber pallets to make the bar. 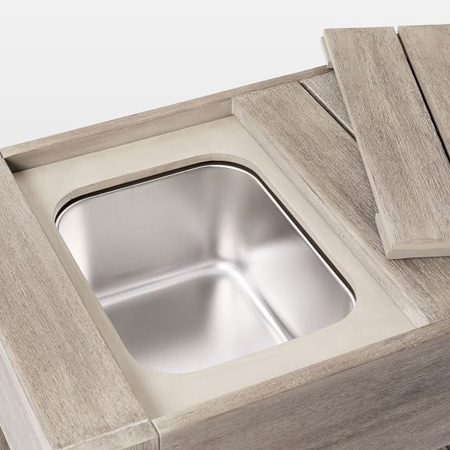 The outdoor bar features a built-in ice box to keep your drinks cold during the summer, and we designed the bar to accommodate a variety of sizes to fit a stainless steel or plastic bin to hold the ice cubes. 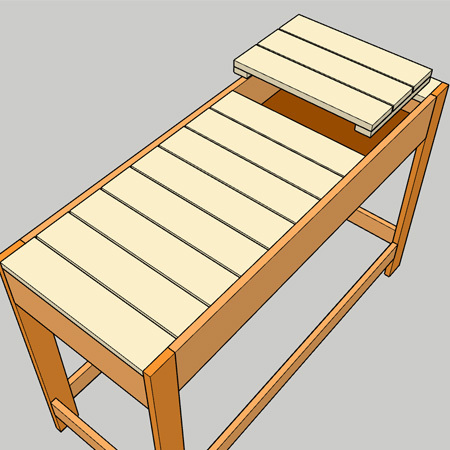 The outdoor bar is assembled using a Kreg Pocket Hole Jig and 32mm coarse-thread pocket hole screws. 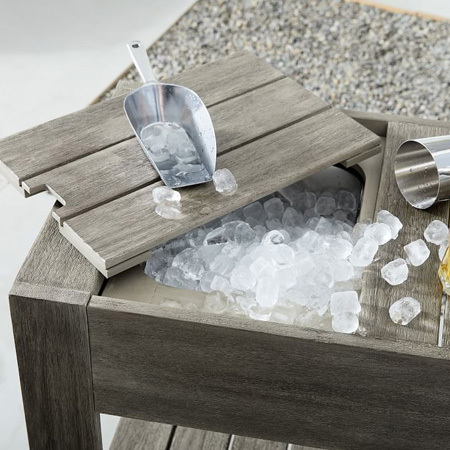 Fit a stainless steel or plastic bin into the outdoor bar for your ice cubes. Cut the top section to size for the size of bin you source for this project. 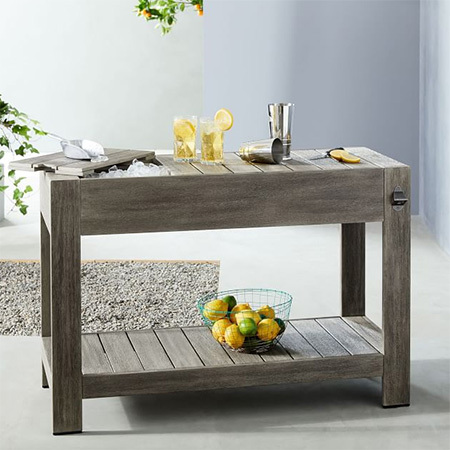 After assembling the outdoor bar you have a variety of options for finishing. If you like the look of this finished bar, use Rust-Oleum Ultimate Wood Stain in Carbon Gray to stain and then finish off with 2 to 3 coats of exterior sealer. 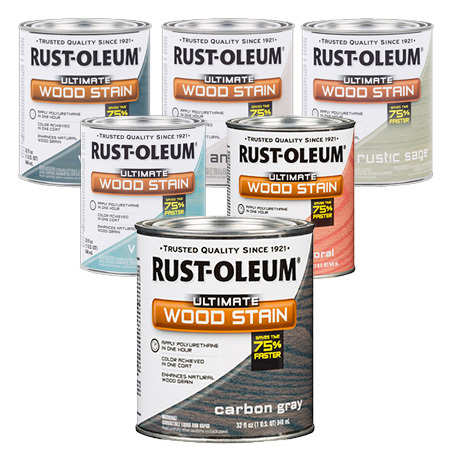 You will find Rust-Oleum Ultimate Wood Stain at your nearest Builders Warehouse. 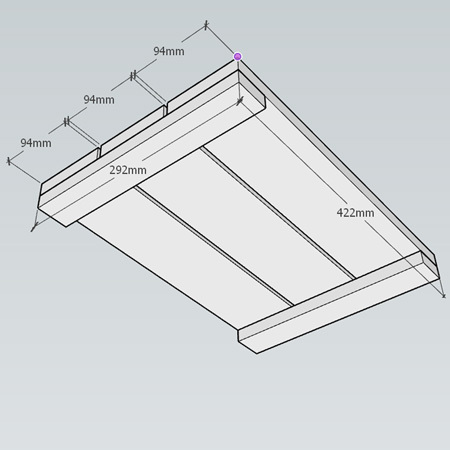 *If you need to make the bin cavity deeper to allow for a bin higher than 70mm, replace the 144 top shelf front/back pieces with 220mm wide PAR pine. GOOD TO KNOW: Remember to set your pocket hole jig for the correct board or timber thickness. 1. Drill pocket holes at the ends of the top and bottom shelf front and back. Secure these pieces to the legs with wood glue and 25mm screws. 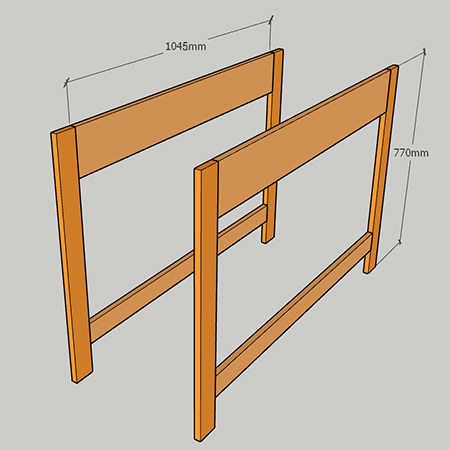 Mount the bottom shelf front and backs at 100mm up from the bottom of each leg. The top shelf front and back is flush with the top of each leg. 2. Drill pocket holes at the ends of the top and bottom shelf sides. 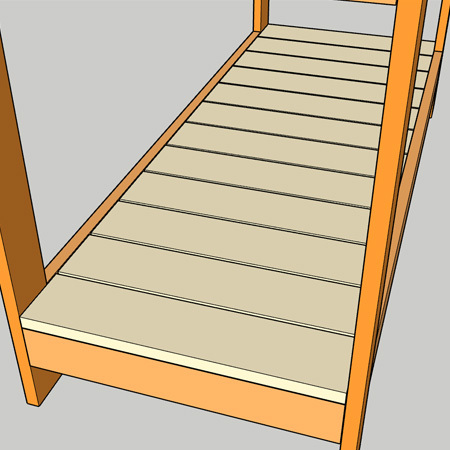 Mount the bottom shelf side at 81mm up from the base of each leg. Mount the top shelf sides at 19mm down from the top edge. Secure with wood glue and 25mm screws. 3. Take one piece of 422 x 400mm plywood and cut out an opening for the stainless steel or plastic bin. The size of the opening is determined by the size of your bin and you want the edge of the opening to the flush with the edge of the bin. 4. Drill  pocket holes along three sides so that you can position the frame at 38mm from the top edge and secure the the top shelf, front, back and side with wood glue and 25mm screws. 5. The plywood shelf supports the stainless steel or plastic bin that serves as an ice bucket. The height for mounting the plywood shelf is determined by the height of the stainless steel or plastic bin. The maximum height allowed is 74mm. You can lower the height of the top frame for a bin with a height less than 74mm - or raise the height of the base, whichever you prefer. 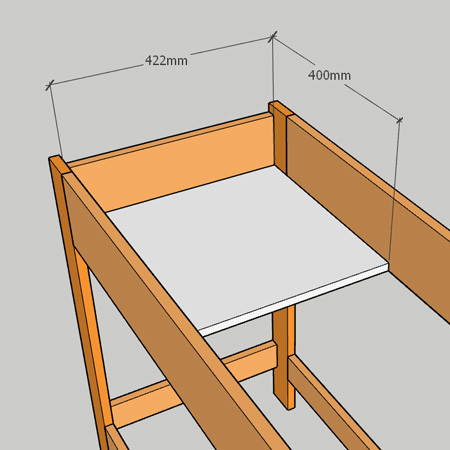 GOOD TO KNOW: If you need to make the bin cavity deeper to allow for a bin higher than 74mm, replace the 144 top shelf front/back pieces with 220mm wide PAR pine. 6. 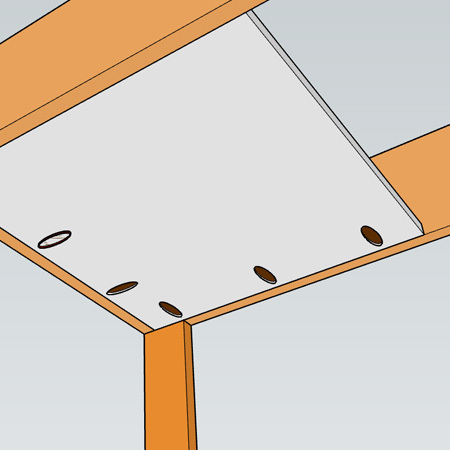 Drill pocket holes on the underside of the plywood shelf and secure to the front, back and side with 25mm screws. GOOD TO KNOW: We left one side of the cavity open to allow you to easily remove and put back the ice bin. 7. 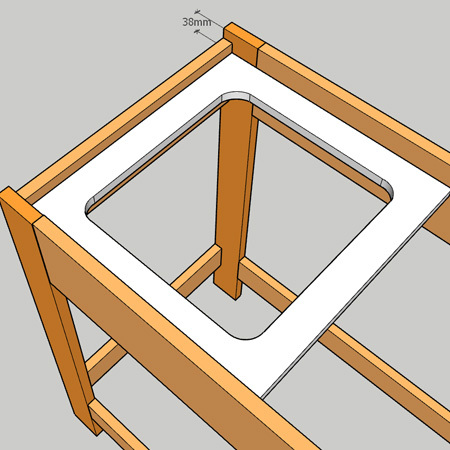 To make the lid for the ice box, layout  slats, each with a 5mm gap between the slats, and join together with  supports. Glue and screw the supports onto the slats with 25mm screws. Countersink all holes. 8. Drill pocket holes at both ends of all the remaining slats and secure to the top shelf front and back with wood glue and 25mm screws. 9. Mount the bottom shelf slats onto the frame - as for the top shelf. 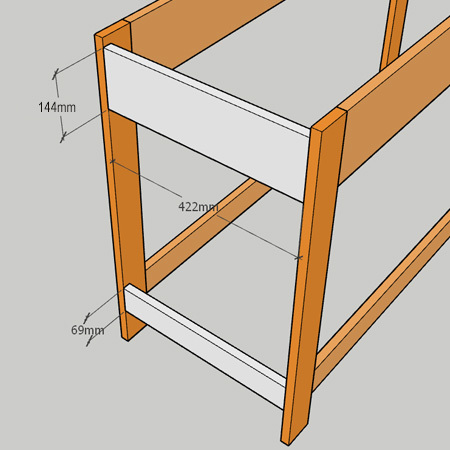 Secure to the bottom shelf front and back with wood glue and 25mm screws.